Correctly picking them up in your diet, you can lose weight by speeding up metabolism and normalizing the digestive process. This principle is used in the fat-burning cocktails. They necessarily contain components that help satisfy hunger or speed up the metabolism. 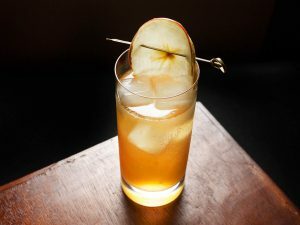 Any dietary cocktail can be bought at a specialized store or cafe but it’s much better to prepare it by yourself. So you can check out the freshness of the products used and accurately follow the recipe as well as save a lot of money. Have a look at the collection of the effective recipes and choose the one you like most. Ginger is very useful for losing weight. It contains substances that contribute to the burning of fatty deposits. Therefore, all fat-burning cocktails for weight loss with its addition are the most effective. 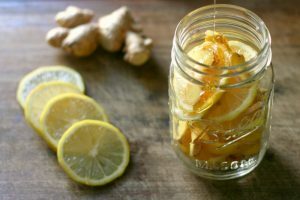 To prepare a cocktail with ginger, you will need to take one whole lemon. It should be peeled and removed from the pulp of all the bones. Otherwise they will give a bitter drink. After this, add to the lemon pulp 50 g grated on a fine grater fresh ginger root and whole grapefruit. The latter also needs to be peeled off. In order the drink does not turn out too sour, you can add a little honey to it. After this, mix all the ingredients with a blender until a homogeneous consistency is obtained and add a little ice. Advice: If the consistency of the drink is too thick, you can add a bit of water. Take any hot sauce that you have in the refrigerator (for example, Tabasco). For one serving of cocktail ½ tsp will be enough. It should be mixed with finely chopped herbs. You can use parsley, dill and something else. To the resulting mixture, add peeled and seeded one tomato, as well as crushed celery stems (2 pcs.). You also need to use red capsicum. Since it is very spicy, it is not recommended to take more than half a pepper. But this is optional. Mix thoroughly with a blender until smooth. Advice: Try the taste of the prepared cocktail. If it seems to you rather rusty, you can add a small pinch of sea salt in it. At the end of the preparation of the fat-burning drink, add a couple of ice cubes. It is not difficult to prepare fat-burning drinks at home. Among the most effective and tasty there is a pineapple drink. For its preparation you need a ripe pineapple. For one serving, there will be enough 4 peeled rings. 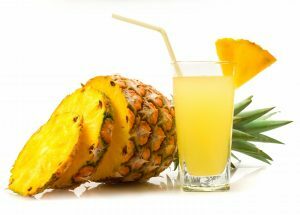 Pineapple pulp should be mixed with the pulp of half a grapefruit, 1 tsp. honey and ice. All this must be well shaken with a blender until a uniform consistency is obtained. 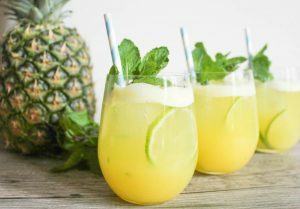 Advice: After that, a refreshing pineapple cocktail for weight loss can be used for the intended purpose on the daily basis. 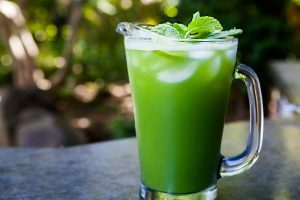 A very effective fat-burning cocktail, which not only allows you to fight excess weight, but also quenches thirst well in the summer days. To make it, you need a couple of slices of watermelon. They should be peeled. In total, for one serving of a cocktail you will need about 200 grams of watermelon flesh. It should be mixed with two peeled kiwi. 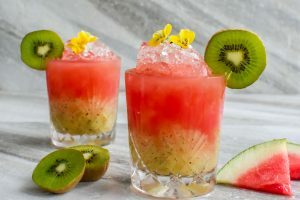 Advice: The resulting fruit mass must be well beaten with a blender, and then add a couple of ice cubes to the resulting drink. This recipe for a fat-burning cocktail is particularly popular among people who constantly control their weight. To make a drink, you need a blender. It will allow to grind all used ingredients to a homogeneous mass. Take a little parsley, cut off the stems and place it in a container from under the blender. add a couple of slices of lemon (make sure that there are no pits) and a couple of mint leaves (here the amount is determined to taste). Poul all ingredients with the cold water (100 ml) and whisk thoroughly in a blender. The fat-burning cocktail is ready! Advice: If the taste of the drink seems too sour, then you can add honey to it, but only a little. 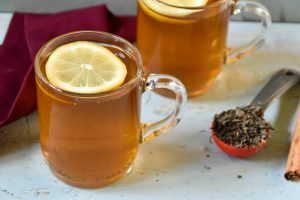 Follow the instructions preparing the lemon drink with honey and cinnamon for weight loss. 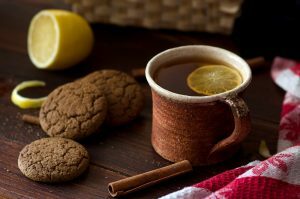 From lemon it is possible to prepare a lot of useful drinks. It is important to know that in cold drinks, more useful substances are retained than in those that are amenable to temperature treatment. Store drinks for weight loss should be in the refrigerator in glass or ceramic dishes. The storage period for drainage, cleaning drinks is 1 day. It is this period of time that vitamins and trace elements retain their usefulness for a person, then they evaporate. Honey for sweets (can be excluded) – 1 tbsp. The lemon zest should be finely rubbed, poured with a glass of steep boiling water and insisted. A jug of lemon juice is squeezed into the jug. Mint should be washed and crushed to lemon. At the bottom of the pitcher, put a cinnamon stick or 1 tsp. ground. Add honey, preferably liquid or already dissolved in water. Pour the infusion of lemon zest. Advice: Add water and mix well. Cucumber is a low-calorie vegetable, which has a lot of advantages. Together with other components in the drink, the cucumber can favor the process of losing weight with the regular use. Cinnamon stick – 1-2 pcs. Advice: Infusion time should be up to 7 minutes. Green tea has long been known and popular, thanks to its tonic and diuretic properties. In combination with other ingredients, the drink can help a person lose weight and get rid of excess weight. Cinnamon stick – 1 pc. Advice: It is better to drink the cooled beverage. Mandarin peel – 200 g.
Slices of lemon or orange – a few pcs. Green tea – 2 sachets or 2 tsp. (without flavors). Preparation: Apple should be cut into small cubes, poured into the bottom of the pitcher. Add the chopped finely tangerine peel to the apple as well as slices of lemon or orange. Brew green tea (1.5 liters), let it brew for 5-7 minutes, then pour the tea into the jug. Advice: Drink after the first cooling. Lemon juice with warm water in the morning helps improve digestion and remove the problem with constipation. Acidified with lemon water prevents the absorption of fats in the body and helps them to withdraw faster. Citric acid in combination with water helps stabilize blood sugar, which improves metabolism and leads to weight loss. It is very important in the period of consumption of the lemon drink control the liquid consumption. 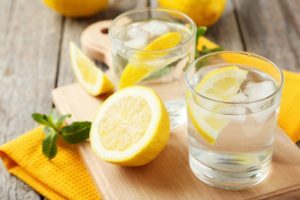 For a day you need to drink up to eight glasses of water with a lemon. Drink is good not only for the weight loss but also is an excellent antioxidant, which promotes the rejuvenation of the body. Variant 2: Take 1/2 lemon juice, add honey – 1 teaspoon and 250 ml of water. In a glass of water stir the honey and let it stand for one hour, so that the honey is well dissolved. Then add the juice of half a lemon and stir. Drink on an empty stomach about twenty minutes before a meal. The above drink is able to improve digestion, since citric acid stimulates the production of gastric juice. And honey has a mass of minerals, vitamins and nutrients that help dissolve fats and quickly remove them from the body. Purified water helps to wash out toxins. Thus, the combination of these three components is part of the program for the weight loss. Advice: Make sure you don’t have the above mentioned contraindications to the drink. Apple water with cinnamon is very effective. This is another delicious and nutritious option for fighting excess weight and fat. 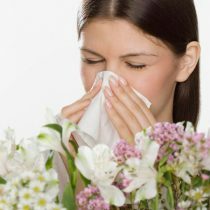 It will also allow you to get rid of toxins more easily. 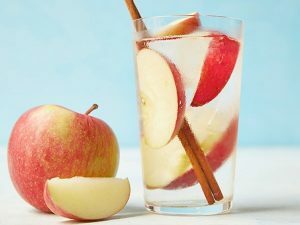 This drink can be drunk up to 1 liter a day, and apples and cinnamon sticks can be used many times. 2 cups water (500 ml). To prepare the drink you should peel the apple and slice it into thin slices. Put in a glass decanter along with a cinnamon stick. Then add ice cubes. Pour water. Leave it for a while until the ice melts. Advice: Drink it during the day. If the recipe doesn’t indicate the use of water it is better to take ice water. It is most suitable for preparing these miraculous drinks. If you do not have time to prepare the water, then you can simply add ice cubes to the drink. If the prescription indicates the need to use sour-milk products, then they need to be taken with a minimum percentage of the fat content. However, it is not worth using fully fat-free products. They will not do any good. As soon as you prepare a cocktail, it should be drunk immediately. You can not store it for more than an hour. So do not prepare a drink for future use. It not only becomes useless in terms of weight loss, but also can greatly harm your health. Use of cocktails should occur between meals. They can replace snacks, but not basic meals. Many people believe that if the cocktail has a fat burning effect, then you can eat anything including even high-calorie foods. You can, but if you do not want to lose weight. If you have a desire to get rid of excess weight, you need to adhere to the principles of proper nutrition all the time. Do not think that home fat-burning cocktails are the only way to become an ideal figure. Its use is an excellent addition to any diet. It will not help you to normalize your weight if you do nothing more. 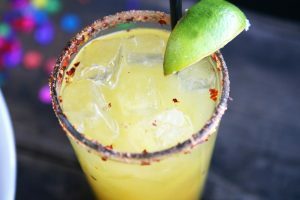 It should be noted that if the recipes of fat-burning cocktails for weight loss do not say that you need to add spices, this does not mean that their use will be superfluous. They are simply added individually, if the person wants. In this case, do not forget that many spices also contribute to active weight loss. So, for example, cinnamon for weight loss is very useful. It promotes the processing of glucose in energy, thereby preventing the formation of fatty deposits. But for this to be true, add cinnamon to milk and fruit cocktails. And use it better in the ground form. Another very good addition to the home fat-burning cocktail is ground black pepper. It contains piperine, which promotes the acceleration of metabolic processes. A lot, of course, to add pepper to the drink is not worth it, a small pinch will be enough. Also, when preparing such drinks, cardamom can be used. This spice also contributes to the acceleration of metabolic processes in the body. With it, fat burning is much faster. This spice is most combined with vegetable cocktails.